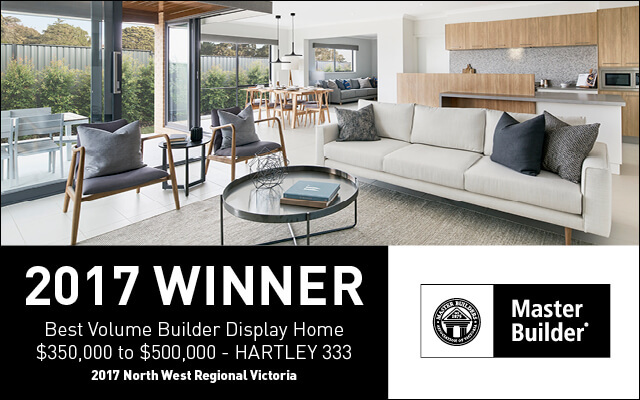 Dennis Family Homes Hartley 333 display in Bendigo has been judged North West Victoria’s Best Volume Display Home ($350,000 to $500,000) at the 2017 Regional Builders Awards – North West. These prestigious awards were held in Bendigo on Friday, 23rd June, 2017. 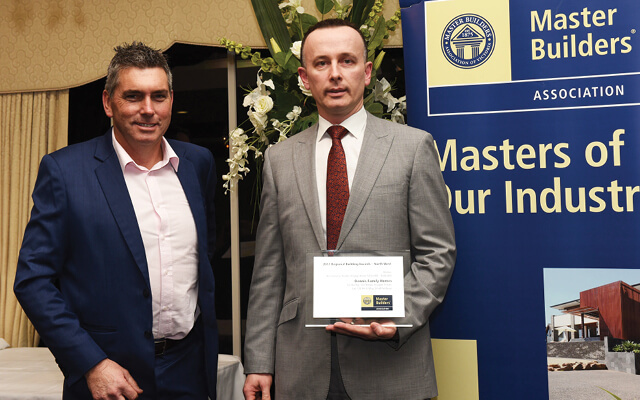 “We are very proud to have received this recognition from the Master Builders Association Victoria,” said Dennis Family Homes Bendigo Area Manager, Sasha Bursac. “My team and I have always felt that our Hartley 333 display was a standout for its high quality interior fittings and functional, family friendly design and this award only confirms this. Certainly, our visitors have always been very positive in their feedback about the home,” he added. Mr Bursac also described the award as fitting recognition of the excellent work of the Dennis Family Homes design and construction team. As the first display in Bendigo built to Dennis Family Homes Premium level of inclusions, the Hartley showcases elements that would have previously been considered optional upgrades, like higher 2550mm ceilings, 40mm stone benchtops in the kitchen, a butler’s pantry, and a choice of custom kitchen island and vanity designs. With its three living spaces, four bedrooms and two bathrooms, the Hartley remains one of Dennis Family Homes most popular designs for its practical floorplan that suits most families, whether they have young children, teenagers or extended family members. Available in a choice of four sizes ranging from 28 squares through to 36 squares and eight contemporary facades options, the Hartley is designed to suit blocks from 16 metres wide. To see why the Hartley has been declared a winner by the MBAV judges, visit the display at Imagine estate in Yirrilil Way, Strathfieldsaye which is open daily from 11am to 5pm. Further information is available online at www.dennisfamily.com.au or by phoning 1800 DENNIS.